Once I was able to successfully grow a bunch of heirloom tomatoes from start to finish, I was hooked. The gorgeous Amish Paste tomatoes were something I wouldn't have found at the garden center. To me, that is one of the biggest advantages to learning to start seeds. It opens up a whole new variety of vegetables that you just can't find otherwise. I am still very new to the whole seed starting adventure, and though there is no shortage of tips and advice out there, I wanted to pass along three of MY tips. These are the three that have helped me the most. This is my fourth spring starting seeds, and each season I learn a bit more. 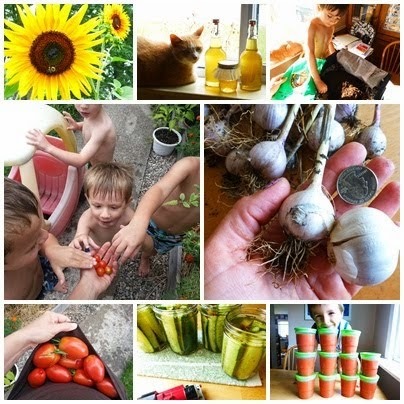 Hopefully you are feeling motivated--and not overwhelmed-- by all the help out here in blogland, and encouraged enough to go ahead and dive into the seed-starting adventure! 1. Try watering from the bottom up. I never knew this, until this year. The kids and I always had great fun spritzing the heck out of our babies with our designated pretty green water bottle. Spritzing all over is fine to keep the soil wet while waiting for seeds to sprout, but the seedlings, once emerged, are actually happier to not get wet all over their leaves and stems. If you have a watering can with a tiny spout, you can try watering around the plants to keep from getting the leaves wet, but I find watering from the bottom up easier. If you are using a seedling tray or 'mini-greenhouse', pour water into the bottom and let the soil soak it up like a sponge into the cells. Watch to make sure the bottom doesn't remain filled with water. Most of the seed starting trays you find in the store (and can be reused over and over) have ridges in the bottom, which is very handy. Keeps some water in the valleys, while the plant trays sit on the ridges. Remove cells and drain water if it is excessive; you want the roots to develop properly and sitting in water constantly will hurt them. I really love watering my babies this way...the soil stays so nice and spongy, and their stems and leaves stay healthy and dry. 2. Don't start everything at once. In fact, don't start some things at all. When we first started gardening, I made the mistake of getting excited, taking all the seeds out at once, and having a seed-starting party. The dates on the seed packet meant nothing; as soon as it felt like spring outside, my instinct was to get everything started. However, there is a reason the seed packets have start dates. It all has to do with your last frost of the season. For example, in my garden; peppers should be started about 8 weeks before last frost, tomatoes about 6, to be ready for transplant by garden-planting time (for my area, Mother's Day is usually the earliest for non-cold tolerant plants). Some seeds really would rather not start out inside, and instead want to be put straight into the ground, like carrots and spinach. Reading up and making your own simple chart of everything you plan to grow, their start dates, and whether or not to start them inside or direct seed, will really help you get organized. The first year, we started cucumbers, tomatoes, lettuce, zucchini and peas, all at once. the plants became wild, weak, and untransplantable. Learning from our mistake! These plants all ended up dying. what things need to be put right in the garden...and a timeframe for all of them. 3. Thin out the seedlings. It's so hard to cut off those beautiful and delicate stems, but it must be done. For most plants, like tomatoes and peppers, each container of soil should only be supporting one seedling. You could save the lives of all the babies and transplant each into its own space, but to me that seems tedious and beyond my skill level, because the stems and root systems are so incredibly tiny and fragile. Perhaps one day I will learn to do that, but for now, the simplest thing to do is very carefully snip the seedling that seems the weakest, close to the soil level. I usually wait until the first 'true leaves' appear, because that is when the babies really start needing more nutrition. The first leaves contained food for the plant, which made it easier to share space; once the true leaves show up, it's time for the plant to seek out more from the soil. There are a lot more tips you'll run into, and some things you will learn by simply doing them yourself. The biggest step is to decide you are going to give seed-starting a try. Good luck with all the seedling adventures this spring! I get a warm fuzzy feeling thinking about all those baby plants germinating and growing in all of my gardening friends' houses right now! New seeds starter ideas are presented in this blog . These ideas would not be best foe https://www.aussiewritingreviews.com/edubirdie-review/ but still we can ahare. This will be an interesting blog for the readers.